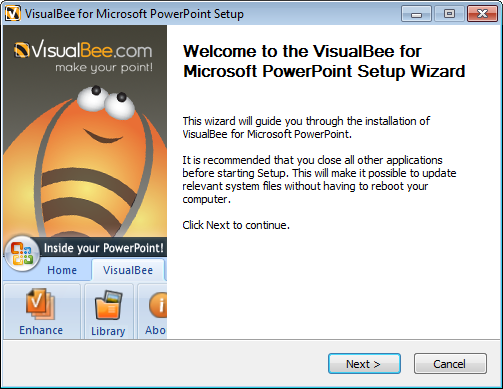 Here you can learn how to enhance your PowerPoint presentations using Visual Bee plugin for Microsoft PowerPoint 2007 & 2010. 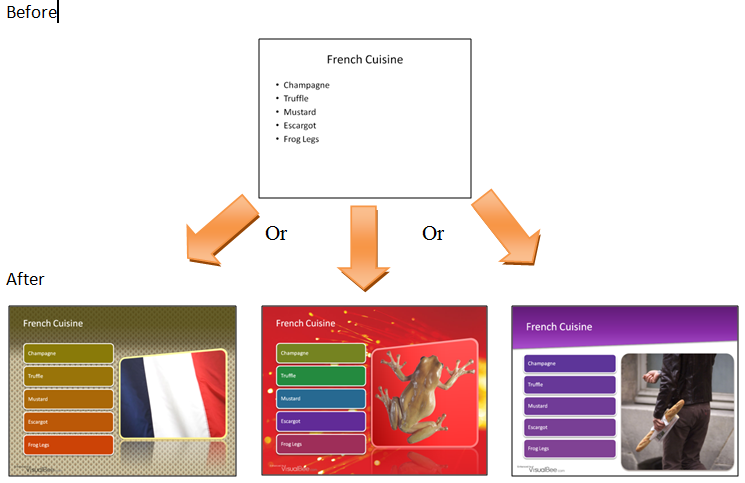 VisualBee is a freemium application to enhance your presentations in PowerPoint. Power users who need other premium features can access to additional capabilities. For example, by using the premium plan you can get access to a very large library of design styles and images and also the ability to brand presentations with your custom company logo. At the moment, the cost is $9 per month or $75 for an annual subscription. First of all, just download the free installer. Then run it and follow the simple installation instructions. Once the plugin is installed on your computer, you can open Microsoft PowerPoint 2007 or 2010 and you’ll notice a new tab available on the menu bar. Once the plugin is installed in your computer, you can open Microsoft PowerPoint 2007 or 2010 and you’ll notice a new tab available on the top. New buttons have been added to this PowerPoint bar. You can click on Enhance Presentation or Re-Enhance Slides to let VisualBee do its magic and enhance your presentation slides. Or, if you are a Premium user you can browse images by clicking My Images and also insert your company logo on every slide. Here’s an example showing a simple slide with a presentation title and bullet points and the way VisualBee can help you convert that slide into an awesome design. And you can as many alternates for each slide as you want until you are satisfied with the results. This is a great tool if you are planning to make a Sales or Corporate PowerPoint presentation for your company and you need to make it look really awesome. If you aren’t convinced yet you can download the free plugin and test it by yourself.